If you have never been to the Warner Brothers Studios before, I advise you to read on and I also advise you to go there as soon as you can because you will see your favourite books and films come to life! If you are not a HARRY POTTER fan you still need to read this as you too will be amazed by what you see. Harry Potter Studio Tours is located in the Warner Brother Studio, Watford, Abbots-Langley, Leavesden. It’s just off the M25 in the north of London. Harry Potter is a worldwide novel and film series written by the wonderful J. K Rowling. The series of 8 books (including The Cursed Child) is a magical world to escape into and has breath-taking adventures included. Let’s get into the tours! Once you walk in, you will get checked to make sure you aren’t trying to smuggle in any Cornish Pixies! You will also be given a Passport to carry with you. The passport gives you lots of information about the tours and also asks you to look out for some very cleverly hidden Golden Snitches. Top Tip – Don’t forget to stamp your passport in each section of the tour! This is a famous quote of a conversation between Albus Dumbledore and Severus Snape. Once you have given in your tickets, you enter a room where you are shown a movie about how magical the experience was for the actors Daniel Radcliffe, Emma Watson and Rupert Grint. Also, some of the behind-the-scene clips! After that, the wall that the movie screen was projected on opens up and reveals the door to the Great Hall. It was a breathtaking experience. 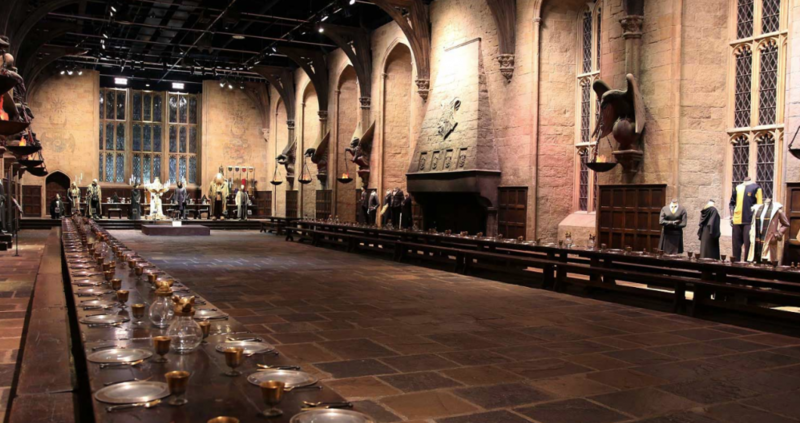 When you enter the Great Hall, you see mannequins of the Professors. Make sure you read the clues on the passport to find the Golden Snitches! All the way through, you need to discover the Golden Snitches though some of them are incredibly hard to find. It took me forever to find one of them! Through the whole of the set, you see amazing artifacts and replicas of all of the props used in the movies. They are most impressive! During your visit, you get to pretend you are summoning a broom stick, riding one and get a picture as WANTED WITCHES AND WIZARDS. Halfway through, you can stop at the café and try some yummy butter beer. Personally, I disliked the cream on the top but loved the fizzy liquid under the cream. Once you are outside the café, there are things like the Knight Bus, Number 4 Privet Drive and the bridge that Lupin and Harry were walking on in the film and book – Harry Potter and the Prisoner of Azkaban. Throughout the next building, they show how all the animations are done like Dobby, for example. It’s really interesting. Next you have the amazing Diagon Alley where you see most of the shops including Weasley’s Wizard Wheezes. The best part (in my opinion) is when you see all the models and all the intricate details that are on every costume. To finish off this fantastic tour, you have the masterpiece, the model of HOGWARTS! It’s incredible and gives you an excellent idea of how big the school is. I hope you enjoy your time at the Harry Potter Warner Brother Studio Tours and you have enjoyed my blog post of the Studio. HARRY POTTER IS THE BEST. I hope you agree with me on that and that Harry Potter is your all-time favourite book and film.